East Rutherford, N.J. – The Jacksonville Jaguars leaned on their defense to spoil the opening week for the New York Giants. 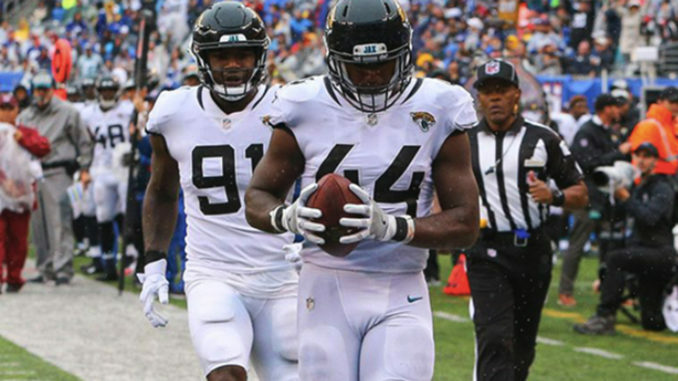 Jaguars linebacker Myles Jack scored off of a 32-yard interception early in the fourth quarter to give the Jaguars the final lead over the New York Giants with a 20-15 win Sunday afternoon. Running back Leonard Fournette would leave the game and not return after a hamstring injury just after the opening drive in the second quarter. Running back T.J. Yeldon would take the helm and rush for 51 yards on 14 carries on the day. The Giants second-overall draft pick, Saquon Barkley, would rush for 106 yards and score one touchdown in his rookie debut. With the return of receiver Odell Beckham Jr., Manning and Beckham would connect for 111 yards of the Giants 224 yards of passing offense. The Jaguars defense, ranked No. 2 overall a season ago, scored seven touchdowns on turnovers, gave no indication of dropping off. The defense had two sacks along with sick quarterback pressures and stopped a two-point conversion to hold off a late drive by the Giants in the fourth quarter. Without Leonard Fournette, the Jaguars offense made just enough plays to keep them in the game. Quarterback Blake Bortles threw 176 yards, completing 18 of 33 pass attempts, throwing one touchdown pass to T.J. Yeldon and leading two drives for fields goals. Eli Manning would complete 23 of 37 passes for 224 yards and an interception. Saquon Barkley broke out on a spectacular 68-yard touchdown run in the fourth quarter but was otherwise held in check by the Jaguars defense Sunday. This was Odell Beckham Jr’s first game since breaking his ankle last season playing against the Los Angeles Rams. Although Manning and Beckham would hook up and complete 11 of their 15 targets, their efforts would fall short after Manning was unable to complete a fourth-down pass on Jacksonville’s 34-yard line. Choosing to throw on fourth down instead of going for a field goal that would have tied the game would prove costly as the Giants would muff a punt from the Jaguars with under a minute left play. Kaelin Clay would fumble the punt on the 19-yard and the Jaguars defense would recover to close out the game with a victory for the Jaguars 20-15. Jaguars: Home opener next Sunday against New England, kick-off at 4:25 p.m. on CBS. The Patriots beat the Jaguars in the AFC title game last season. Giants: Visit Dallas for the Sunday night game at 8:20 p.m. on NBC.